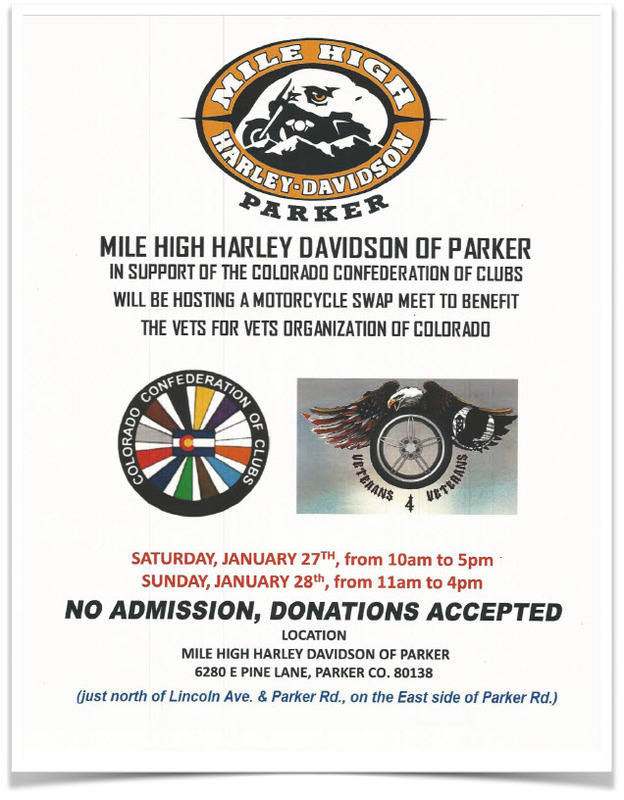 The post Harley Dealership Swap meet Created After Motorcycle Expo Bans Mongols appeared first on Motorcycle Profiling Project. This entry was posted in Motorcycle Profiling Project on December 22, 2017 by Webmaster. 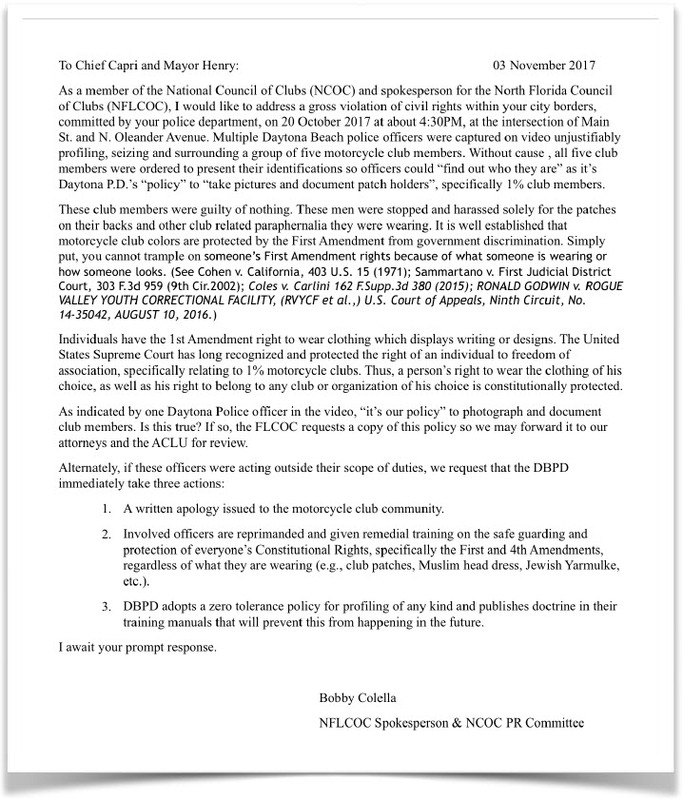 A recent incident in Modesto, California further evidences that law enforcement is employing a new strategy to target motorcycle clubs. The MPP has reported on the the national trend towards law enforcement attempting to disarm motorcycle club members, including those that have no criminal record, for no other reason than their association with a motorcycle club. In fact, many incidents, including the instant case in California, involve individuals that have a Carry Concealed Weapon license, which also means they have no criminal record and have undergone extensive background checks. Infringing on the right to legally carry strikes at the heart of biker culture. There are nearly a million registered motorcyclists in California. According to the National Motorcycle Profiling Survey 2017, the Second Amendment right to bear arms is supported by 99% of all bikers. The Second Amendment is likely the one non- motorcycle related issue that almost all bikers agree on. Unfortunately for California, the 9th Circuit Court of Appeals has ruled that carrying a weapon outside the home is not covered by the Second Amendment, which means concealed carry is a discretionary privilege and not a right. This also means that revoking CCW’s do not violate the Second Amendment. The positive impact is the hope that this growing threat to the Second and First Amendments will generate further support and participation in the movement to combat motorcycle profiling legislatively, at the state and federal level. In May 2017, an alleged associate of the Hells Angels Motorcycle Club was stopped while riding with two others, one of which authorities claim was a full patched Hells Angel that failed to yield for law enforcement. It was discovered that the alleged associate had a CCW. As a result of this stop, Sheriff Adam Christianson, representing the agency that issued the CCW, was notified by Modesto PD relating to the individual’s alleged association with the Hells Angels MC. 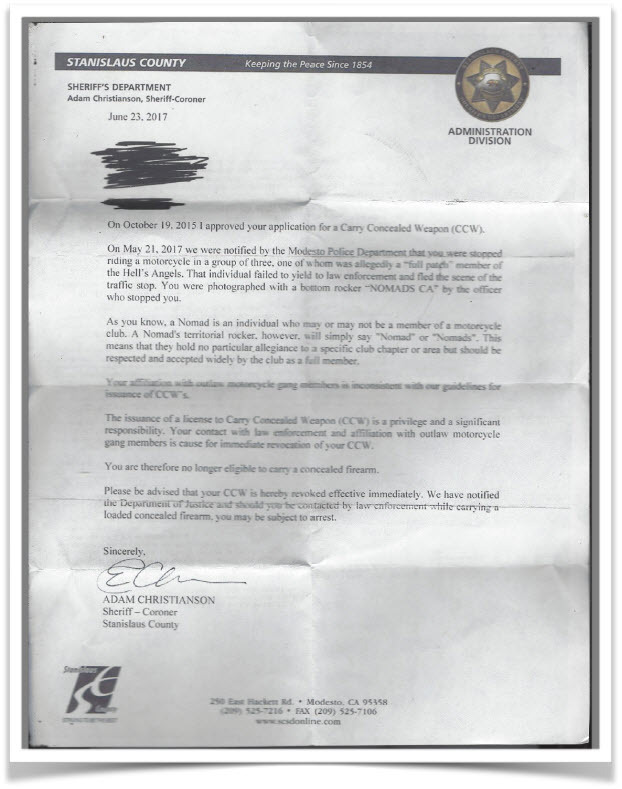 Sheriff Christianson then notified the alleged associate that his CCW and right to carry a weapon was revoked based on his alleged association with the Hells Angels. 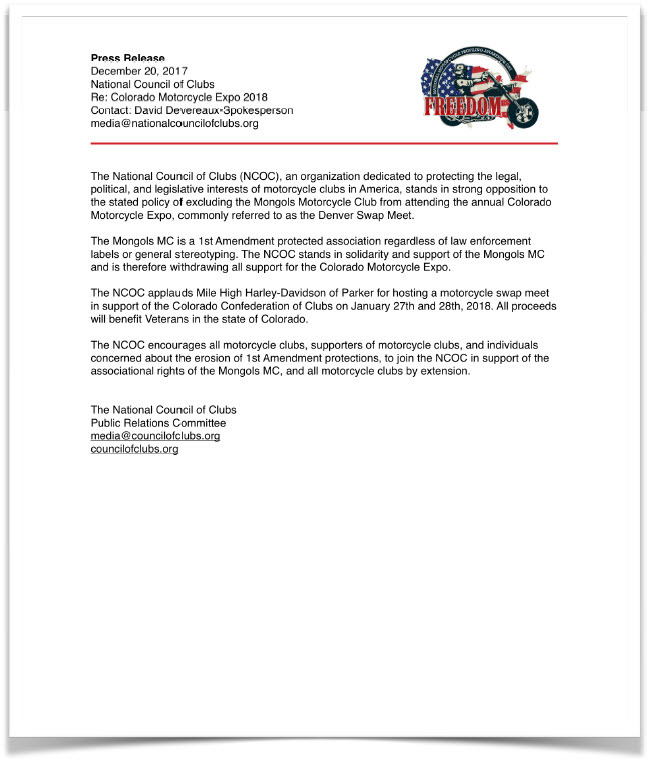 Sheriff’s Letter Revoking CCW For Associating With Outlaw MC’s. Why do they get away with it? Additionally, California is what is termed a “may issue state”, meaning that it is up to the discretion of the jurisdictional Sheriff to approve or revoke an individual’s right to concealed carry. The long-term impact on the civil liberties of patch holders, and then likely others, is very alarming. To blatantly target a community and revoke their rights to carry solely based on association, with no personal guilt of any crime required, sounds like a slippery slope. The MPP believes that the ultimate solution lies in legislation that directly challenges statutes that allow extreme discretion when imposing restrictions on privelages like CCW’s based on an individual’s 1st Amendment associational rights. Legislative directives that require those reviewing CCW applicants to disregard protected associations like motorcycle club membership, would provide much needed protection related to legal carry. 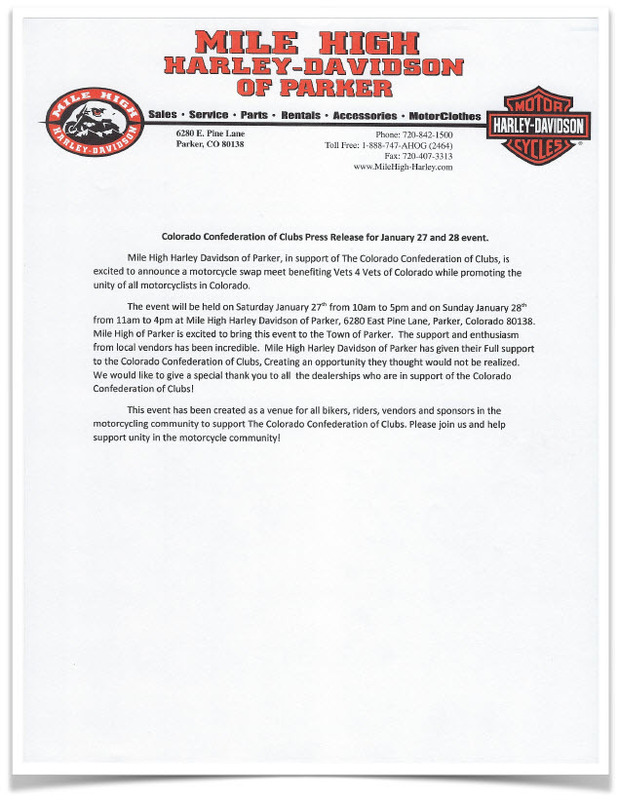 The post Sheriff Revokes Gun Rights for Associating With Hells Angels appeared first on Motorcycle Profiling Project. This entry was posted in Motorcycle Profiling Project on December 2, 2017 by Webmaster.